We've all been anxiously awaiting news about The Wayfarer since owner Jeff Chon took over the skeleton of the shuttered Detroit Bar earlier this year. Last month, we noticed the new branding on the Costa Mesa club's old Facebook page its main website. Recently, you may have noticed the curb side marquee on 19th St. trumpeting the change over. And yesterday evening, the club finally announced its very first show with rap legends EPMD on July 17. The New York duo are just in time to celebrate the 25th anniversary of their 1989 album Unfinished Business. Next on the calendar is a performance from LA band Kitten on July 25. The club will start selling tickets on its website this Thursday. While we certainly dig The Wayfarer's old-school approach to kicking off the building's new chapter, the decision to keep the performance side of the venue tagged as “The Detroit Bar Stage” has some folks curious about Chon's plans to proceed with his brand while still being tied to the old one. Considering all the changes he plans to make to the place, is it a smart move? “Places don't need to completely change in order to be great, I do think they need to evolve though,” says the 30 year-old restauranteur–who also spent plenty of nights at the venue himself while growing up in Costa Mesa. Yesterday, we stood outside the venue with Chon as crews drilled and hammered away at his unfinished vision. Some of the old posters from the last week of Detroit's existence were still clinging to the rear entrance door. During a walkthrough with Chon, we got a chance to take a peak inside the unfinished new design of The Wayfarer. From our first impressions, it seems promising. The stage is still essentially gonna be in the same place as it was, give or take a little. The ceiling has been elevated, which should help with sound. The fact that they're spending a ton of dough on some new sound equipment should help a little as well. Similar to Casa taking over Avalon Bar across the street late last year, there's obviously this movement afoot to class up this corner of 19th St. in Costa Mesa in ways that entrepreneurs think we want to see. Of course only time will tell if they're right. 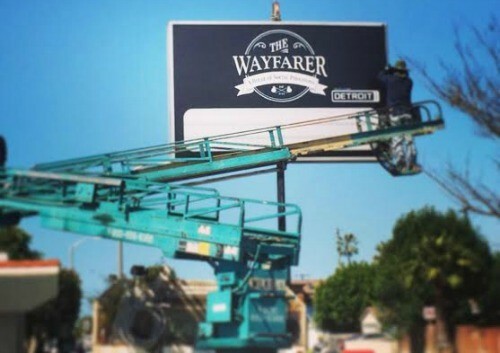 While Chon insists draft beers and everyday bar staples of the old place aren't going anywhere, there will be a tasteful attempt by The Wayfarer to get you to stay way longer, which always bodes well for business.